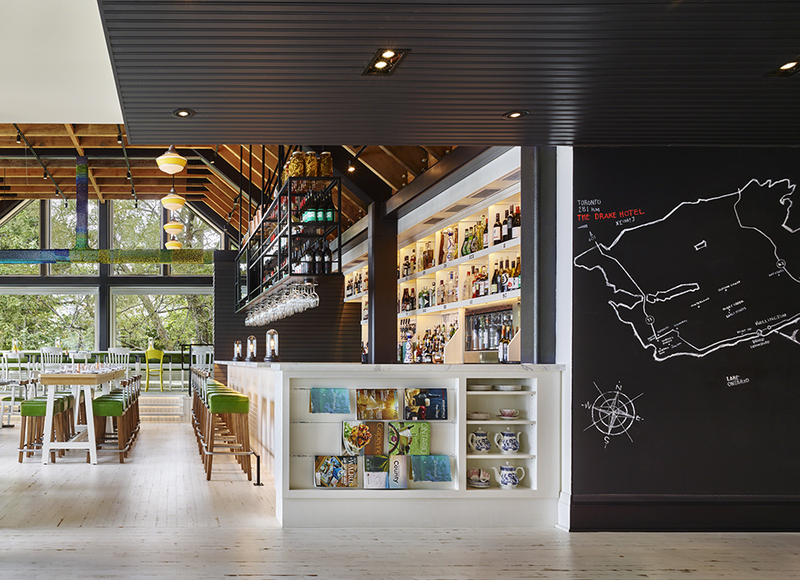 The Drake Devonshire hotel is located on the shores of Lake Ontario in the town of Wellington. In addition to the guestrooms and suites, the hotel offers amentites including a restaurant and bar stocked with local wines. Designer John Tong left the Douglas fir beams exposed in the dining area exposed to create a "camp mess hall" feel. The one-armed bar stools, covered in green leather, are similar to the pieces he designed for the Drake's Toronto outpost. Pendants from the Barn Light Electric Company and custom table laterns from Bookhou Design illuminate the space. A chalkboard wall highlights local events and places to visit. In order to bring a Turkish spirit into Babaji, a restaurant in London, Istanbul-based firm Autoban created textured blue ceramic tiles inspired by Marmara marble to line the interior. Traditional Iznik tiles, handmade by Turkish craftsmen in Istanbul, are also integrated into the design. An oven for baking pides, a type of Turkish pizza, sits on the ground floor. Custom oak, metal, and leather furniture is inlaid with brass detailing. In Córdoba, Argentina, this luminous, modern restaurant was once a minuscule passageway between buildings. Architect Ernesto Bedmar had previously converted an unused alley into a loft. As it started to deteriorate, he had the idea to transform the space into a high-design restaurant called El Papagayo. The site is under eight feet wide and around 105 feet long. Bedmar worked with CAPÓ Estudio to refine the interiors. The existing concrete slab ceiling was replaced with glass to let natural light enter. AvroKO—the hospitality design firm with serious muscle—expands its growing empire with an inaugural project in Chicago, Momotaro. AvroKO worked with Boka Restaurant Group on the design. "The ground floor of Momotaro channels the spirit of a Tokyo office space of the 1950’s and 60s, where the salaryman spent his days, with an izakaya on the lower level that's inspired by yokocho: the back alleys that sprang up in Tokyo as post-war black markets," explains AvroKO partner William Harris. Kin Kao is a 25-seat restaurant that chef Tang Phoonchai, his wife, Min, and Terrence Feng opened in Vancouver, British Columbia. They enlisted architects David and Susan Scott of local firm Scott and Scott Architects to build out a 750-square-foot space located at near an area where commercial, industrial, and residential zones meet. Scott and Scott created a minimalist space using affordable finishes—and a vivid wash of blue. "As with the menu of Thai street and homestyle dishes, the space celebrates ordinary materials and simple details which are light hearted and familiar," David says. Brooklyn design studio hOmE, run by brothers Evan and Oliver Haslegrave, is the duo behind a number of beloved restaurants, bars, and retail spaces in Brooklyn and Manhattan. Their projects are united by a simple material palette—wood, tile, and stone abound—paired with geometric touches and elegant lighting. One of their projects was the Brooklyn bar Tørst, a wood-lined space with custom, textured wall paneling and communal seating. Beer is served from a Carrara marble-backed tap. Picnic-style tables give the space a subtle geometry. At Lima's El Mercao Restaurant, the theme is old meets new—not just in the food, where acclaimed chef Rafael Osterling puts a new twist on classic Peruvian dishes, but also in the architecture. Opened in 2010, the restaurant is located in the city's Miralores district. On the triangular site, architect Jaime Ortiz de Zevallos created a "little green area" in the semi-industrial area. "The focus is on the working counter," Ortiz de Zevallos says of the space where shellfish and seafood dishes are served to eager crowds. Throughout the dining area, the floor is made of recycled wood. A restrained interior by architect Annabelle Selldorf adds gravitas to restaurateur Danny Meyer's latest hotspot, Marta, inside the new Martha Washington hotel. While the overall feeling of Marta and the hotel public spaces pay homage to the building's venerable history, Selldorf is responsible for a few subtle touches that open up the space, including stripping the interiors of decorative elements left from previous remodels, as well as dropping the floor a few feet. Frank Tjepkema founded his industrial design firm, Tjep., in Amsterdam in 2001 and has since produced objects in scales from minute to massive. On the tinier end of the spectrum, he has designed conceptual but wearable jewelry for Dutch design leaders Gijs Bakker and Marijke Vallanzasca. On the larger side, he's completed commercial interiors ranging from restaurants to airport kiosks, seen here. Locally sourced food and materials aren’t new in the world of high-end dining. But when designer Ignacio Cadena began working on a new concept in Jalisco, Mexico, for chef Alfonso Cadena, he took a whole new approach to sourcing material. After six months of digging and searching for the restaurant Hueso, he assembled a set of 10,000 bleached animal bones, which, when set in boxes with cooking utensils and objects in a way that calls to mind Robert Rauschenberg, turned the interior of the restaurant into a slightly macabre mural. With a 1,600-square-foot garden and wood-lined interior, Bar Agricole brings a craft touch to San Francisco’s otherwise industrial SOMA district. Aidlin Darling Design called in a team of local artisans to construct the building’s oak “hull,” which is made of reclaimed whiskey barrels. Seated at the bar are a row Vintage Chairs by Restoration Hardware. Check out Dwell's 10 Best-Designed Bars in America here. In Buenos Aires, a key reason to visit its La Boca neighborhood, aside from the colourful Caminito street, is for the contemporary art gallery Fundación Proa, which regularly holds international exhibitions. The terrace eatery is a fantastic spot for a relaxed lunch. Check out Dwell's full design guide to Buenos Aires here. A recurring theme in Beijing's history is the grand architectural gesture. In the Temple Restaurant, European fine dining takes place on the grounds of a 600-year-old temple that was used as a television factory during the Cultural Revolution. The beautiful lot is also home to a boutique hotel and gallery. Check out Dwell's full design guide to Beijing here.